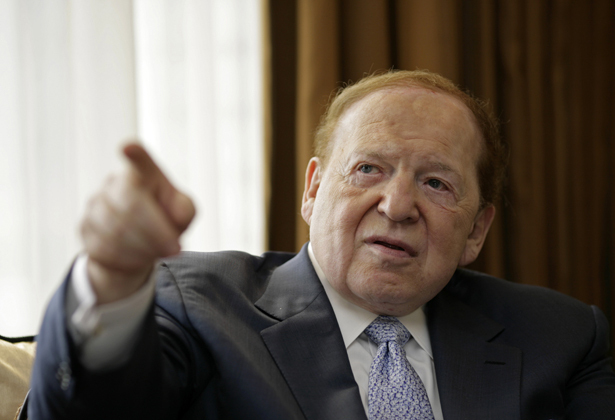 Did Sheldon Adelson Just Up the Ante on Scott Walker’s Behalf? With campaign-finance rules collapsing, a billionaire moves last-minute money to Wisconsin Republicans. Polls have made it clear that Wisconsinites do not want the anti-labor governor to run for president and that they do not think he can bid for the GOP nod and serve effectively as governor. So the Vegas run was risky. But Walker appears to have hit the jackpot. On October 23, Adelson inked a check for $650,000 to the Republican Party of Wisconsin. And, on October 23, the Republican Party of Wisconsin made a $450,000 “in-kind” contribution to Scott Walker’s re-election campaign. Adelson is, indeed, super-wealthy. Estimates of his casino-fueled fortune run in the range of $40 billion—and rising. Adelson is, indeed, a super donor. He gave in the range of $150 million to Republican candidates and causes in 2012, according to ProPublica. That, Politico noted, was more than anyone else has given in the history of American presidential politics. He has also been a generous supporter of Scott Walker, using a special recall-election loophole to donate $250,000 to help the governor hold on to his post in a 2012 recall election. Now, he has found another way to influence Wisconsin politics in an election where Walker’s political future is at stake. Under what remains of Wisconsin campaign finance law, Adelson cannot tell the Republican Party of Wisconsin what to do with his money. He can’t, for instance, designate Walker as the direct beneficiary of his largesse. The party can, however, spend money to help its priority candidates—and no one would question that re-electing Walker is the Republican Party of Wisconsin’s top priority. That’s also a priority for Adelson, who gave a maximum direct donation of $10,000 to the Walker campaign earlier this year. In all, Walker’s campaign has raised roughly $25 million since early 2013. That’s a good deal more than his Democratic challenger, Mary Burke, who has raised roughly $15 million—including $5 million from her own fortune—according to the latest reports. And that’s not counting all the “independent” expenditures that have filled Wisconsin television screens with negative ads. But, with polls showing him in a dead-heat race with Burke, Walker is griping about not having enough money this year. After all, if he loses this year in Wisconsin, he will have a hard time competing in the real “Sheldon Adelson primary” with all the Republican presidential prospects who will be looking for billionaire backing in 2016.